The FlipFlopi dhow, a 9-metre traditional sailing boat made from 10 tons of discarded plastic. 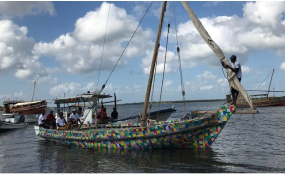 After completing a historic 500km journey from the Kenyan island of Lamu to the Tanzanian island of Zanzibar, the world's first ever traditional "dhow" sailing boat made entirely from recycled plastic, known as the Flipflopi, has successfully raised awareness of the need to overcome one of the world's biggest environmental challenges: plastic pollution. The UN Environment agency's (UNEP) Clean Seas Campaign joined forces with Flipflopi for the journey down the East African coast, which began on 23 January, ending on 7 February, with the aim of inspiring citizens from Africa and around the world to become more aware of the dangers of plastic pollution. The Clean Seas campaign was launched in 2017 to urge governments, businesses and citizens to eliminate major sources of marine litter - microplastics in cosmetics and the excessive, wasteful usage of single-use plastic - by the year 2022. Each year, more than 8 million tonnes of plastic ends up in the oceans, wreaking havoc on marine wildlife, fisheries and tourism, and costing at least $8 billion in damage to marine ecosystems. Up to 80 per cent of all litter in the oceans is made of plastic. UN Environment's Clean Seas - Flipflopi expedition, is the latest chapter in Kenya's push to become a global pioneer in tackling plastic pollution. In August 2017, the country introduced the world's toughest ban on plastic bags with anyone producing, selling or using a plastic bag, risking imprisonment of up to four years or fines of $40,000. The next step for Flipflopi will be a journey to the Kenyan capital of Nairobi, where Heads of State, environment ministers, environmental activists, innovators, NGOs, and CEOs of multinational companies will gather for the fourth United Nations Environment Assembly - the world's highest-level environmental forum - from 11-15 March 2019. Copyright © 2019 Africa Renewal. All rights reserved. Distributed by AllAfrica Global Media (allAfrica.com). To contact the copyright holder directly for corrections — or for permission to republish or make other authorized use of this material, click here.